What a College Football Season for the Magnolia State of Mississippi!!! 1. Mississippi State - The Bull Dogs have beat LSU, Auburn and Texas A&M. Three straight regular season wins against Top 10 teams. No one has that resume. 2. Ole Miss - The Rebels are 6-0 for the first time since the 1960's with wins against Alabama, Boise St and a dismantling of Texas A&M in College Station. The Ole Miss defense is for real. 3. Baylor - Right now the Bears are the best of the Big 8. The showdown will be on 11/8 at Oklahoma to determine the conference winner. 4. Florida State - Sorry, but FSU has played nobody and the ACC has no good teams this year. A lot will be made out of next week's Notre Dame game, but they too are way too highly over-rated this year and I am a ND fan. 5. Auburn - The Tigers are the best 1 loss team in the country. Their schedule is the most difficult in college football. 7. Notre Dame - Their entire season hinges on the Florida State game; however, even if they go undefeated I am not sure if I would out them in the top 4. Remind you, I am a huge Fighting Irish fan. Just realistic. 9. Alabama - With no consistent QB play, the Tide is in trouble. Yes, and I also believe that under Chip Kelley the team was far more disciplined. Right now it looks like it's good to be a college team in Mississippi! Another bizarre weekend in college football. Who knew Arkansas would test MS State ??? ECU breaks into the top 25 only to be beaten by Temple ??? Ole Miss & Auburn in a dead heat - and Florida beats UGA?? The terps refuse to shake hands at the coin toss with Penn State???? Even with the post game apology that is a real sign of the times that fights like thugs are happening even before the game starts. Klaas - looks like your Ducks are doing well against Stanford. Son's team had another win this week, I was able to make their game last weekend and my godson met me there. Snuck away with son post his meetings the night before the game for a visit and a late dinner, have to say it's such a treat for me whenever he has time during the season for family. He finishes grad school at the end of this quarter and so the drive to find his next real position is real and vivid for him now. Glad his team has improved so much and he's played a big role with the offense and their young QB, hopefully it will help. The most fun for me is watching him signal in all of the plays during the games. So where is Frijole? Her Huskies had another win today. Great Owl's team lowered the boom on poor Rutgers, those kinds of blow-out's are hard on the heart for the losing team. I hope everyone is having a good weekend and finding something to cheer about in the ups and downs of college football. It's been a great year to watch college football! 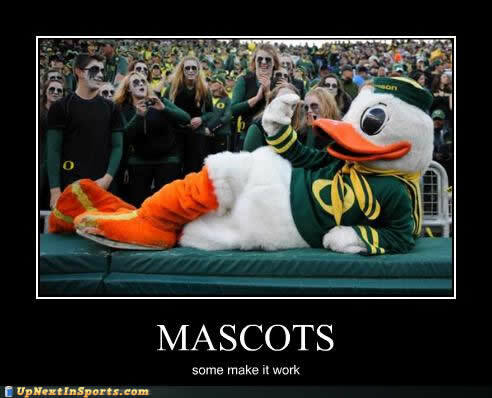 Yes, the Ducks are looking pretty good right now. Hopefully they can stay healthy! Glad to year your son's team won and you got to spend some time with him! Thanks Klaas - they won again this weekend and now in contention to win their conference Amazing to go from last to possibly first in one year !!! Hope this helps him find his next position! Been working all weekend on a system implementation so can't say I've kept up with the other teams this week. none- Your sons team is doing very well, even better than his Alma mater! Definitely a bowl possibility next month. Tell him to keep up the great job! Yes where is Bean these days Nebraska is doing great! Oregon has a bye week. BIG GAME TODAY that I won't miss! Should be a great game! After another exciting weekend of college football that saw BAMA beat Miss St, If I was doing the college playoffs, these would be my top 4 teams. Take into account, unlike what it would appears that the committee does not consider strength of schedule or a win close against a lame team that that should be a blowout, I do. I think we all have the common sense of what is called the Monkey eye test. With all due respect to the following teams, when you are in a weak conference and playing even weaker teams, you do not get rewarded for barely getting by. If there was a stronger team out there with one loss who was convincing, I would have no problem taking FLA ST. out of the top 4 as I do not believe that barely beating 4 opponents, 4 of which who were unranked and 1 who was over-rated and now out of the top 25 anything to be proud of. TCU - Sorry, you can't struggle against Kansas (3-7) with a 34-30 win and expect to be in the top 4. You lost to Baylor and beat an OK team that is no longer in the Top 25, beat a West VA team no longer in the Top 25 and an OK State that is out of the Top 25 and may not even be bowl eligible at seasons end. Problem facing the Big 12 is the fact they have no Championship game. All the other power 5 conferences do. Arizona St. - The loss this weekend to an unranked Oregon St 35-27 pretty much ends their run. Even if they manage to win the PAC-12 South, hard to believe they can beat Oregon. Baylor - They just have not played anyone. Their only important one was the win against TCU. They played no out of conference schedule which can explain why in 3 games they out-scored their opponents 178-27. They would have had better competition against Cedar Hill, Allen or Katy ... the best High school teams in Texas. They finish up with OK St, Texas Tech and K State, a combined record of 15-14. Baylor may actually win the Big 12, but they may still fall behind TCU. Ohio State - Really, does anything really need be said? It's the BIG 10. When the new AP polls come out this week there is be only 3 teams out of 14 in this conference ranked in the TOP 25, OSU, Michigan St and Wisconsin. Their remaining games are against Indiana & Michigan, who have a combined record of 8-12 and a BIG ten record of 3-9. We had to listen all week about Ohio State's statement win yet they barely beat an inferior Minnesota team. Sorry, the Buckeyes don't even come close to the Top 4. Pac-12 Champs! Home of the 2014 Heisman Trophy Winner (I hope). Ready for the Rose Bowl on January 1, 2015!!! Thanks Kiwi, was able to make their last game over Tgiving and have to say they played 'up' with more discipline since they had less pure talent on their team. Good to see the progress and waiting now to see what their bowl assignment will be. I am so out of the loop I only heard yesterday that Bo was replaced at Nebraska and have to make time to read up and discover why? Working again today but really excited to say that with my first cloud implementation for F&A, HRIS, & CRM that we are 100K under budget for this year and 35 days ahead of schedule with testing? INDEED Klaas - hope they win the Heisman !!! What a great team those Ducks are !!! Well said Red - ever considered being a sports analyst? I wish Back in the day I was considering coaching. Alabama, Oregon and Florida State and Ohio State will join in the inaugural College Football Playoff. The No. 1 Crimson Tide will face the No. 4 Buckeyes in the Allstate Sugar Bowl, and the second-seeded Ducks will face the third-seeded Seminoles in the Rose Bowl presented by Northwestern Mutual, both on New Year's Day. The 12-member selection committee bumped TCU from the top four in favor of the Buckeyes, who defeated Wisconsin 59-0 in the Big Ten championship game on Saturday. The Horned Frogs, ranked No. 3 in the previous rankings, dropped to No. 6, behind Florida State, Ohio State and Big 12 rival Baylor. Without Baylor and TCU in the College Football Playoff, the Big 12 loses out on $6 million for having one team in the playoff field. WOW, what a bunch of crap, but I say let's do it. I am looking forward to Alabama introducing Ohio St. to SEC football. Winning a bad conference does not make you top 4. 4. ACC and BIG TEN tied for last. A distant last place. 1. Alabama vs. 4. Ohio St. in the Sugar Bowl, Jan 1. My prediction, Alabama and Oregon will be playing for the National Championship. BAMA is going to introduce the Buckeyes to what it means to play quality football. The Big Ten has been a joke this year and every team they deemed good like Nebraska, Wisconsen, Michigan St. and Ohio St have all been over-rated. Giving Saban multiple weeks to prepare his defense and the Crimson Tide playing a meaningful game spells bad news for OSU. If FSU had trouble with Georgia Tech's offense, I can't imagine what they are going to do with the tempo and high powered Quack Attack. FSU's luck is going to run out in the Rose Bowl. Marcus Mariota is the man! 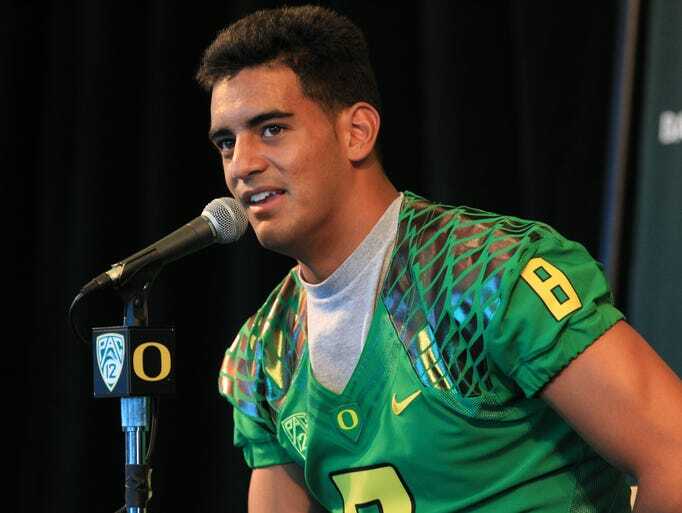 Marcus Mariota well deserved winner of the Heisman!